Ryder System, Inc. (NYSE: R), a leader in commercial fleet management, dedicated transportation, and supply chain solutions, announced today the launch of COOP by Ryder™ (COOP - pronounced "koop"), a new asset sharing platform and the first of its kind for commercial vehicles. The digital platform offers businesses the opportunity to list and rent underutilized commercial vehicles within a network of trusted peers. "COOP by Ryder aims to revolutionize the optimization and utilization of commercial trucks by helping fleet owners get the most value out of their fleets," said Robert Sanchez, Chairman & CEO, Ryder. "We are excited to launch this new platform that makes trucks shareable at a time when the sharing economy is driving innovation in many industries. Seasonal and cyclical truck shortages, coupled with fleets' excess and unused capacity, demonstrates the benefit of having a technology like COOP available in the marketplace. COOP represents one of several strategic investments we are making to leverage technology and capitalize on disruptions our industry will see over the next five to 10 years." "As one of COOP by Ryder's initial users, we could not be more excited about the value this platform can bring to our operations," said Alex Garcia, Vice President for Dixien, LLC. "In our experience with COOP so far, we've been able to make money from vehicles that previously sat idle, and it's clear it could have a real impact on our business. This is an innovation we've been waiting for." 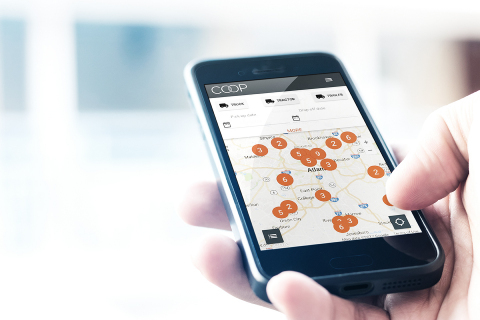 COOP by Ryder™ is a commercial vehicle sharing platform that links fleet owners with idle vehicles to trusted businesses in need of rental vehicles. COOP's mission is to make trucks shareable for everyone everywhere, affording fleet owners the opportunity to generate revenue from their idle vehicles and providing businesses with an alternative source of rental vehicles. For more information, visit COOP.com and follow COOP on Facebook and Twitter.